Well as we head into this afternoon's big game, we at least have some positive news on the injury front. 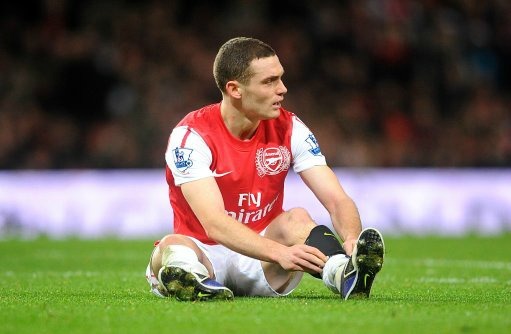 It appears that Thomas Vermalen has passed a fitness test yesterday, according to the Sunday Mirror, and if there is no reaction will be in line to start later. It will be a huge boost to the team if Vermaelen plays, especially in the continued absence of Kieran Gibbs and Andre Santos. While Francis Coquelin and Ignasi Miquel have done as good a job as they can filling in on the left hand side, they are youngsters playing out of position. With the Belgium international returning to the defence, we should be more solid, even if it does mean we get back to a situation where we are playing for central defenders across the back line. I'm expecting the starting line up to be: Szczesny, Djourou, Mertesacker, Koscielny, Vermaelen, Song, Rosicky, Walcott, Ramsey, Arshavin, van Persie. I think that with Rosicky having a full week of training under his belt, he will come into the team in place of Yossi Benayoun, allowing Aaron Ramsey to return to his normal position as the player closest to van Persie. On the bench, you would have thought the manager will delay his decision as late as he can to see whether Thierry Henry is fit enough to play a part in the game. I don't think there is any chance he'll start this afternoon, but if he can give us an option from the bench, that would be a good start. Otherwise the only other senior striking option we have is Ju Young Park - a player with exactly zero minutes of Premier League experience. The manager has picked out Theo Walcott and Wojciech Szczesny as two players who can make a difference this afternoon. "I think he is coming back now. He had a dip over Christmas. "I found people were a bit harsh on him at Swansea because in the first half he looked dangerous to me. In the second half he scored the goal and having seen the game again he created some dangerous situations. "That was not the case at Fulham, for example. In training I think he is on the way up again." I think last weekend wasn't the best example of the player Theo Walcott can be for us. I think he has improved a lot this season, especially in his defensive play. But he still frustrates me in front of goal. He also goes missing in games and doesn't try and force his presence into a match. It seems for some that whilst it's ok for Walcott to blend into the background because he's younger than say Andrey Arshavin - who rightly gets stick for his lack of tracking back. However Arshavin is a proven talent. A player who can change a game. Walcott has yet to do that - consistently. And you could probably argue - rightly in my opinion - that Arshavin doesn't prove his talent on a consistent basis for the club. But he does have more in his locker to undo games. Walcott only has his pace. I would love to see Walcott consistently perform for Arsenal. Whilst he is very limited as a player, he does what he does well on many occasions but still hasn't progressed as we would have all like him to have. I think the next five months are vital to him. If he can prove to the manager through his performances he deserves a new contract, then I'm sure he'll be rewarded. But at the moment I don't think you would consider giving him the money he wants because he does perform to a consistent level week in, week out. Let's hope the manager is right and he has one of his better games this afternoon. Meanwhile the boss has absolved Szczesny of any blame for what happened at Old Trafford in August. "I talk to him when he concedes a goal and I think he is responsible. "But at United you wouldn’t even consider that he had a chance to save the ball. Every time the ball went into the top corner." I agree with the manager. The goalkeeper didn't make any mistakes during that game and I hope that none of us see a result like that one again. A bit of transfer tittle-tattle? The People claim we're locked in a three way tussle for the signature of Southampton teenage left back Luke Shaw.